Francesco Redi was a 17th century Italian poet and physician who studied medicine and philosophy at the University of Pisa. Having succeeded his father as court physician to the Grand Duke of Tuscany, in 1655 Redi became a member of the Accademia della Crusca – The Academy of the Bran, which was founded in Florence in 1582 to maintain the purity of the Italian language. In 1668, Redi published Esperienze intorno alla generazione degl’insetti – Experiments on the Generation of Insects which is still regarded as highly influential work. 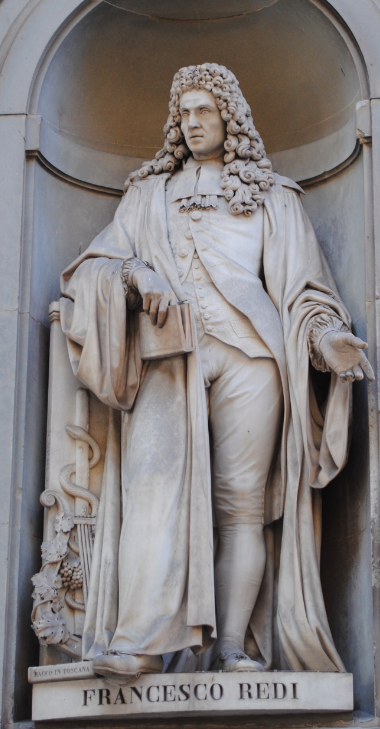 The statue of Redi is the work of the 19th century Italian sculptor Pietro Costa and stands in a niche along the facade of the Uffizi Gallery.